It was early 1900 and in a small town in the Province of Cuneo, at the foot of Monte Viso, there was a humble bakery where bread was made daily, with a golden, crispy and tasty crust. The production rates remained unchanged for years until one day, with the changing of times and the evolution of things, it was decided to try using sourdough (it was already used for bread) in the production of cakes. 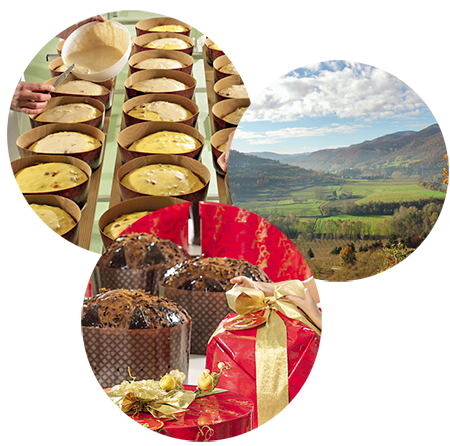 It was right in that time that the "Panettone Albertengo" was made for the first time. So in addition to the traditional fragrance of bread, the delicate scent of sweet and tasty cakes could be smelt from far away. Since then, many years have passed and a lot has been achieved on this specialised quality journey in this field, to bring highly qualified products,ideal for the most refined and delicate palates, on our table every day.